After a hearty breakfast, Cliff took me to the airport, and off I went to FAUP (Upington - note: one "p"). 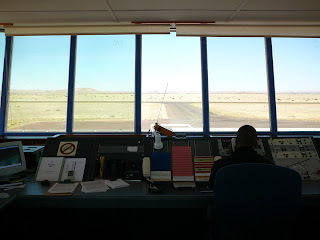 Here I cleared customs and immigration, fueled up, and went up to the tower for a weather briefing and to file my flight plan across the border into Namibia. Here's my little plane, nose in the wind. My clearance/landing permit was ready, but I called the Namibian Civial Aviation Directorate to confirm that my change of aircraft is on file. The helpful guys in the tower tell me that if I arrive in FYKT (Keetmanshoop) after 1500Z (that's 17:00h local time, 5pm for our American friends. I note in passing that this primitive "am/pm" method of denoting time necessitates deadlines of, for example, 11:59pm, since nobody knows whether 12:00pm is noon or midnight. Far from the elegance of the 24 hour clock. End of digression. ), they will charge me a $500 call out fee for international arrivals (apparently they bring out the fire equipment), so I hop back down and expedite departure. 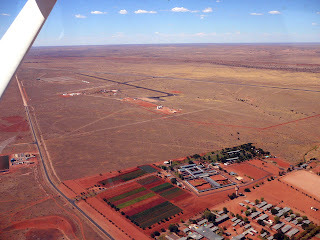 Upington has one of the longest runways in the world at 4900m (the longest runway in Africa, longer than any in the US). The story behind it is quite interesting. Took me a long time to identify the airport, because I could not believe that this was a runway... Here's a picture taken when departing Upington. There's a shorter runway visible in the middle, and the long one extends behind it, beyond the boundaries of the picture. 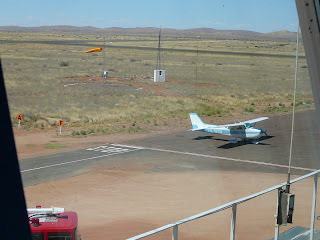 Soon I approached FYKT (Keetmanshoop, Namibia), diverting a bit to avoid a local thunderstorm. The tower asked me to expedite, as customs and immigrations were ready and waiting and wanted to go home. Upon arrival, they were very friendly and quick. Alcock from the Namibian Airport Company gave me a ride into town and dropped me at a guesthouse, the Schützenhaus, with "Knobelclub 1907" and "Mitgliederkneipe" (member's bar). It's also the base of Turnverein "Gut Heil" (I hasten to add that this is a common, traditional name for sports clubs in Germany, and nothing to do with Nazism as far as I know - certainly predating it). 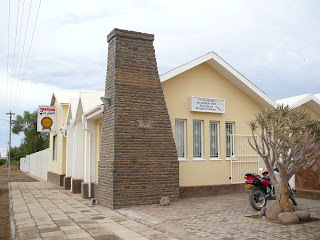 More vestiges of the time when Namibia was a German colony: Das Kaiserliche Postamt (The imperial post office). Quick history: Inhabited by Khoisan people (Khoi aka Hottentots, San aka Bushmen), later Bantu. 1884 Bismarck claimed it as Deutsch Süd-West Afrika. During WW I, oocupied and later administered (under a mandate by the League of Nations) by South Africa. Full independence in 1990 (before the downfall of the South African apartheid regime 1994). 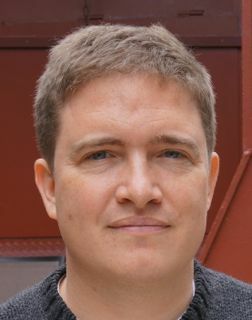 Entering Namibia: FAKD-FAUP-FYKT was published on November 29, 2006 .